The No. 3 Nebraska volleyball team posted a 3 -1 (25-10, 23-25, 25-15, 25-11) win over the Iowa Hawkeyes in front of 8,097 at the Bob Devaney Sports Center on Wednesday night. Mikaela Foecke had 20 kills and nine digs while hitting .459, Jazz Sweet had 15 kills and Lexi Sun added 13 kills and 13 digs on .385 hitting as the Huskers won their 14th straight match to improve to 14-1 overall and 5-0 in the Big Ten. Iowa dropped to 10-6 overall and 2-3 in the Big Ten. Nebraska had a .373 to .071 hitting advantage, and freshman setter Nicklin Hames had 47 assists and 11 digs. 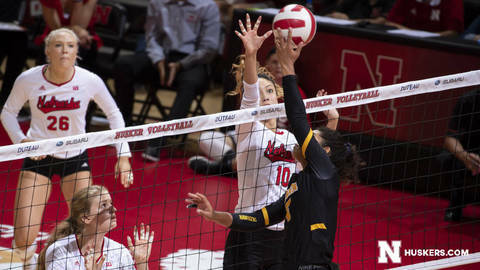 Kenzie Maloney had 12 digs as the Huskers posted nine more than the Hawkeyes, 50-41. Nebraska served 11 aces, including three by Sun and Maloney, and two each by Maloney, Hayley Densberger and Lauren Stivrins. Callie Schwarzenbach and Stivrins led the team with five blocks each. Set 1: The Huskers went up 13-7 after a 4-0 run served by Hames, which included an ace. Six players combined for the Huskers’ first nine kills. The lead went to 10 at 18-8 after Sun served an ace and tipped home her fourth kill for a 9-1 Husker run. Densberger served back-to-back aces to end the set at 25-10, giving the Huskers five aces in the set. NU hit a season-best .789 in set one with 15 kills and no errors on 19 attacks. Set 2: Iowa got off to a quick start in the second set, taking a 5-2 lead. The Huskers trailed 11-6 before Stivrins started a comeback attempt with a solo block and an ace. Sweet and Sun terminated to make it 12-11 Hawkeyes. Sweet recorded two more kills to keep the Huskers within striking distance, and a Foecke blast tied the score at 14-14. Nebraska reclaimed the lead briefly at 16-15 on a tip by Foecke, but Iowa answered with a 4-0 run to go up 19-16. Nebraska trailed 23-20 before a pair of Iowa errors and a Schwarzenbach and Sweet block tied the set at 23-23. A service error by the Huskers gave Iowa set point, and the Hawkeyes won the set 25-23 after a Husker hitting error. Set 3: Nebraska never trailed in set three, going ahead 15-6 after a 5-0 run sparked by a kill and block by Hames and two blocks by Schwarzenbach. Kills by Sweet and Foecke and a block by Stivrins and Hames made it 21-11 Huskers. Nebraska went on to win 25-15, hitting .333 and holding Iowa to -.026. Set 4: After Iowa scored the first point, Nebraska reeled off a 7-0 run to take control. Sun served two aces, and Schwarzenbach, Foecke and Sweet all had kills. Iowa pulled within 14-9, but Nebraska went on an 11-2 run to win 25-11 with Foecke contributing two kills and Stivrins posting back-to-back blocks. Up Next: Nebraska hosts No. 5 Minnesota on Saturday at 7 p.m. The match will be televised on NET and will air on Husker Sports Network radio affiliates, Huskers.com and the Huskers app.